Before cement mixers pour concrete, engineers configure HVAC systems or architects create renderings, building owners must first determine what type of contractual arrangements they will enter into with their architecture firm and construction company. These legal agreements, called project delivery methods, are every project’s roadmap for the roles, relationships and levels of involvement between owner, architect and contractor. 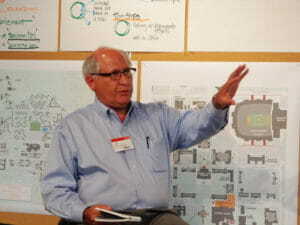 FSB Education Market Principal Fred Schmidt engages stakeholders in a design workshop. Schmidt, who’s taught architecture students about project delivery methods as an adjunct professor at the University of Oklahoma, said he was proud of FSB’s ability and belief in walking clients through the different delivery method options and to help them understand how each would apply to their projects. The firm is always available to help make recommendations about which method would be the right fit, taking into account a project’s scope, schedule and budget. They also encourage clients to work with an attorney during this process. Take for example Design-Bid-Build, a popular delivery method for owners looking to manage cost through a competitive contractor bidding process. The owner enters into the contract with the architect first. Once the design is finalized, construction companies bid for the work and the job is awarded to the lowest bidder. Since the construction contractor doesn’t engage in the project until the architectural decisions are finalized, there is a huge importance placed on the architect’s production of highly detailed construction documents. For owners with budget-driven priorities, Design-Bid-Build projects are an attractive option. Civic clients like municipalities and counties often favor this delivery method. The downside, Schmidt said, is that owners don’t evaluate the contractor because the lowest bidder automatically wins. Contrast this with the Construction Manager At Risk delivery method, where the contractor joins the project much earlier — during the design phase. Contractors have expertise in cost-estimating, scheduling and constructability that can be valuable to incorporate into the design. They can suggest modifications that might use materials more economically, or shorten the construction schedule. “This adds an extra layer of quality assurance from an entirely different perspective,” Schmidt said. This delivery method also minimizes the need for excessive detail from architects in construction documents. During the design process, contractors can provide feedback about which parts might be difficult to build and help architects prioritize and focus their efforts. Those owners who prioritize a tightly orchestrated construction schedule and an efficient design process might prefer Construction Manager At Risk. Owners hand-pick both contractors and architects by interviewing and considering experience and qualifications, and they hold contracts with each. For extremely complex projects requiring high-quality construction, owners might opt for a Design-Build delivery method. 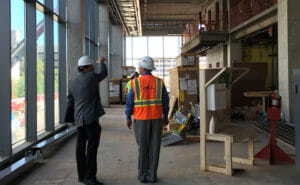 Here, the owner selects architect-contractor teams and holds only one contract, with the contractor. Architect and contractor are involved from the project’s inception. Ideally, they will work closely with each other and with their subcontractors from defining the project on through the building’s completion. For this reason, Design-Build also lends itself to accommodating challenging schedules. Far from competing for the most competitive, lowest bid, in Design-Build contractors carefully select skilled subcontractors to deliver the quality of construction the client needs. Schmidt said the firm carefully researches and considers a potential contractor before teaming for a Design-Build project. To be competitive, both the contractor and architect must impress the owner. And, the architect relies heavily on its working relationship with the contractor throughout the project. FSB places a strong emphasis on counseling its clients about how Design-Bid-Build, Construction Manager At Risk, Design-Build and other project delivery methods might fit their priorities. Because the firm has worked countless times under each arrangement, FSB clients have come to expect a high level of expertise and familiarity, no matter which delivery method best suits their project. To learn more about how FSB is working with clients on all these delivery methods, contact Senior Principal Fred Schmidt at fschmidt@fsb-ae.com or Gary James, President & CEO, at fsbceo@fsb-ae.com, (405) 840-2931.